Decorative Life: Many weeks under proper conditions. Related species include chrysanthemum, sunflower, daisy, gerbera. Leaves hairy and finely divided. 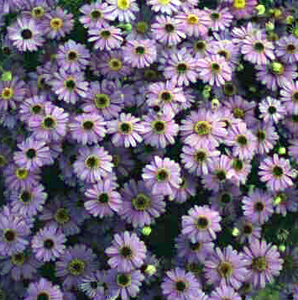 Rapid growing, bushy annual with mostly blue daisy type flowers. Unknown but assumed to be about 34-38F. Drought tolerant. Blue flowered species in the Asteraceae are uncommon. The genus name is Greek for short hairs referring to the short hairs of the pappus. Common series include Mini and Jumbo Outback Daisies, Outback Fan Flower and Outback paper Daisies.